Hemel Hempstead Town FC captain Jordan Parkes capped off what was an excellent season last Friday, as he picked up all three major awards at the club’s presentation evening – which included managers’, players’ and supporter’s player of the year. Parkes hit 30 goals in all competitions in what was a superb opening season in the Vanarama Conference South for the Tudors. We are all aware of his achievements representing Hemel, however how many knew he played for England U20 at the FIFA World Cup in Egypt in 2009? Parkes also played alongside well known Premier League stars and enjoyed a footballing upbringing with newly-promoted Watford, including a debut penalty goal. 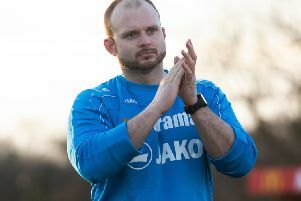 After a professional career that continued with Barnet, Parkes took the decision to step out of the game with a new business idea, as well as playing for his local club at Vauxhall Road. To find out more about Jordan’s story and what life is like after professional football, watch Luke Weston’s video here.